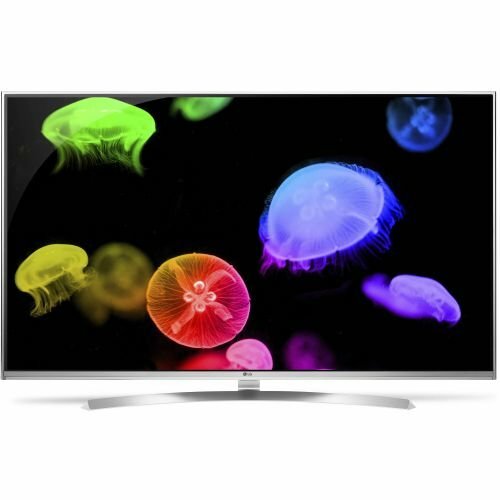 Enjoy wide viewing angles and vibrant colors with the LG 55UH8500-Series 55"-Class UHD Smart IPS LED TV. IPS technology is designed to enhance color quality while widening viewing angles for a wider range of positioning options. Its UHD display will produce detailed 4K images, and its TruMotion 240 Hz refresh rate will reduce the blur associated with fast-moving objects. HDR Super and Dolby Vision will further enhance image quality, while Ultra Surround is designed to improve onboard audio. LG Super UHD TVs support High Dynamic Range plus Dolby Vision together to deliver deeper black levels and superior brightness for enhanced contrast ratio, plus over a billion colors. Thanks to IPS 4K Quantum Display technology, LG Super UHD TVs are able to reproduce more shades of more colors with finer gradations plus deeper black levels and higher peak brightness. This yields a more accurate, more lifelike picture from a wider viewing angle. An antiglare, low-reflection screen coating helps the TV achieve superb black levels and a high contrast ratio for an enhanced Ultra HD picture. The LG Cinema Screen design features a slender bezel along the sides and top edge for minimal distraction from the picture. Earning the Energy Star means adherence to strict energy efficiency guidelines set by the US Environmental Protection Agency and the Department of Energy. Energy Star-certified TVs are more energy efficient than conventional models, saving energy in all usage modes, such as sleep, idle, and on.